The colour contrast of Doc M Pack is highly important and in the design making sure that there is an accesssible toilet, ensuring that the grab rails amd seat are highly visable. Cistern complete with screw down lid for extra safety and security. 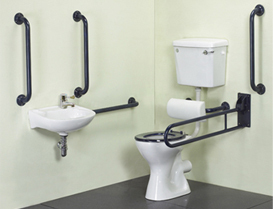 Make sure that the walls are either darker or lighter than your grab rails as its highly important that the grab rails are visable enough for people with visual impairments. The Doc m comes with a spatula lever which is ideal for wheelchair users and can be situated on correct side of the cistern. The doc m pack consists of a sturdy drop down rail colour co- ordinated and ergonomic design with slip resistant grab rails. The basin is wall hung and comes with brackets.